So you’ve heard about BeepXtra and want to know how Beep works for store owners. you issue BeepXtra Loyalty cards to your customers. The more you issue, the better BeepXtra will work for you. Well, a customer comes to your store with their BeepXtra card. they purchase something and you offer a discount cash back straight onto their beep card. How much cash back you offer is up to you; it could be 5%, 10%, 15%, even 20%. 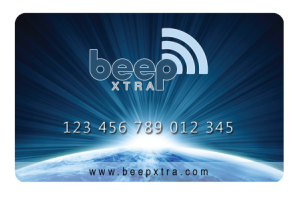 Whatever amount you offer in cash back goes onto the BeepXtra loyalty card. A customer spends £100 and you offer 10% in cash back. A returning loyal customer means one happy store, and cash back means one happy customer. BeepXtra encourages people to get back to the high street to support local businesses. There’s even more good news: when a card issued by you is used in another BeepXtra store, you earn even more cash back. One of your customers goes to another BeepXtra outlet for a little shopping trip. Once again, the retailer gets paid, BeepXtra gets their fee, and the customer gets their cash back. As this was your loyal customer, BeepXtra pays a commission to you. You’re getting paid even when your customers shop elsewhere. BeepXtra’s store cash back scheme. Ask your BeepXtra contact about other ways BeepXtra can help your business.